For less than the cost of a cup coffee a day! Allergen Reporting is not just the right thing to do, it's now the law. Be sure that your menu accurately describes the allergens in yours dishes. Complete Nutritional Analysis for you and your customers. Provide the answers that your diners demand about the food that you serve. Nutritional & Allergen Training for chefs, kitchen and serving staff. Classroom and hands-on workshops delivered in your own kitchen. Simple Supplier Ordering at your fingertips. Reduce waste and cut costs. Stop throwing your profits into the dustbin. MenuAnalyser provides comprehensive nutritional analysis of every dish on your menu including allergen warnings as required by the new EU legislation. 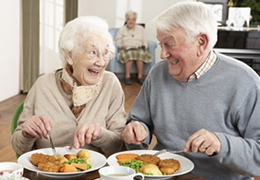 MenuAnalyser helps you to provide your residents with food that matches their dietary needs and will help them to stay healthy and active.